New for 2012, the kurt adler angry birds license includes this ul-listed 10-light injection mold angry birds light set. 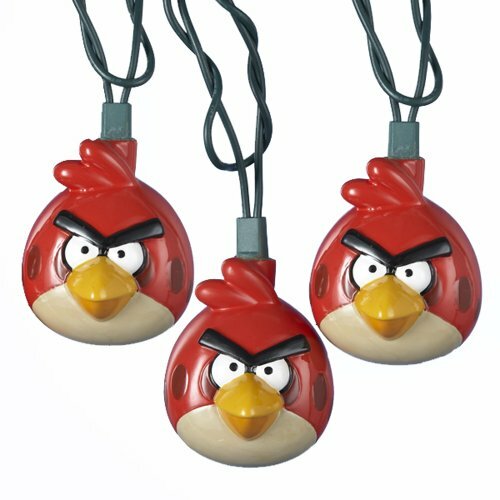 Each of the 10 lights in this novelty indoor/outdoor light set is covered by an aptly-named angry-looking red bird figure true to the game's animation style; light your tree and home in a completely fun, unique way! Each bird measures about 2-inch in height, 2-inch in width, and 3-inch in depth. Each set has a 30-inchx12-inch green lead wire, and 12v 0.08a clear incandescent bulbs.